The KSFF is underwritten by donations. This program is subject to change. Before there was Laurel and Hardy, Stan Laurel (1890-1965) had a good career in films. He was best known for making films parodying the most popular features of the day. Mud and Sand, Dr. Pyckle and Mr. Pryde, The Soilers…you get the picture. The Noon Whistle isn’t one of the parodies but instead shows a side to Laurel’s film character that most don’t remember now. All we like to think of is meek and mild Stanley opposite big and blustery Oliver. But this film shows Laurel as something of a pest, antagonizing lumber mill foreman James Finlayson (1887-1953) past bearing in this comedy from producer Hal Roach. Laurel is credited with writing this story which is a rarity; although Laurel was the creative force behind much of the Laurel and Hardy films, he hardly ever took or was given credit for it. Directed by George Jeske (1891-1951), who started his film career acting in comedies before moving over to directing. — 10-11 min. One of our favorite Charleys, Charley Chase (1894-1940) stars in this comedy short about a guy trying to get out of an arranged marriage. He hasn’t met his intended but he just knows it’s a bad idea. So, he comes up with a “crazy act” that will surely put off his future in-laws. Meanwhile he meets the girl of his dreams (Martha Sleeper) who is also trying to elude an arranged marriage…Chase (1893-1940), unlike his contemporaries, never made the transition to feature films, staying in two-reelers into the sound era. Likewise, his lovely co-star Sleeper (1910-1983) never strayed far from short films before moving over to character parts in sound films, ending her career in 1945. Oliver Hardy has basically a walk-on role here as one of Chase’s crazy-act victims; this is where Hardy’s career at Roach was at this time--secondary and walk-on roles in other stars’ films. It’s possible his career would have never taken off without that fateful pairing with Stan Laurel. — 20 min. 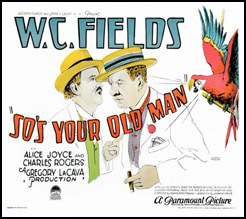 When you think of W. C. Fields today what movie first comes to your mind? I bet it’s not a silent movie. Fields in a movie without that great voice? Yes indeed, W.C. Fields (1880-1946) came to film already well known by audiences as a popular vaudeville performer. 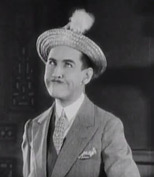 Throughout his film career he would mine the wealth of vaudeville gags and sketches he created, tweaking them, enlarging upon them, then wrapping a story around them. Fields plays a druggist who is besieged on all sides—by his family as well as his customers. He has a lovely clerk who works for him at the store--Louise Brooks (1906-1985), in her fifth or sixth film (she had six films released in 1926); her character catches the eye of a con artist hence the name of this film, an old con artist’s phrase. The film is directed by Eddie Sutherland (1895-1973) who started in vaudeville, then graduated to film comedies before becoming a director. He is also remembered for being wed to Louise Brooks for a brief time. — 77 min. Morning - starts at 9 a.m.
Come early and enjoy an overview of Silent film history. 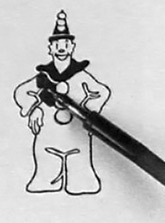 One of our first animated stars was Koko the Clown, the creation of Max Fleischer (1883-1972), a true pioneer of the animated film in the U. S. He started a series titled “Out of the Inkwell” in 1918 starring Koko; the true originality of the series was the combination of live action and animation that each had. Max’s brother Dave joined him in directing these little gems and this eventually led to the brothers having their own studio. Koko’s star waned, like many silent stars, with the coming of sound; he was relegated to playing Betty Boop’s sidekick in sound films. The Fleischer’s had a long and influential career in films, one of the few true rivals to Walt Disney. — 8 min. 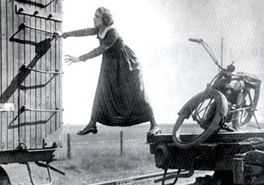 Originally titled The Hazards of Helen, it is one of (if not the) longest non-feature length series ever filmed at 23 hours—119 12-minute episodes that ran in theaters from 1914-1917. Unlike the popular serials of the day, Hazards of Helen didn’t end each episode with a cliffhanger; each wrapped up their short adventure by the end credits. There were three Helens in the series; the original Helen was Helen Holmes (1892-1950), a plucky actress who did her own stunts. 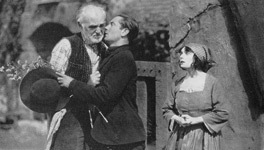 Holmes starred in the first 26 episodes, ending with The Wild Engine, directed by Jack McGowan (1880-1952). Holmes and McGowan left to start their own production company and the series carried on with a new star and director. 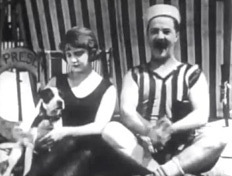 Two years after the series ended, in 1919, Helen was “re-activated” with the release of “The Adventures of Helen;” producers took several existing episodes, retitled them and had a new series to give to the public. The Wild Engine then became episode 1 in this new series. — 20 min. 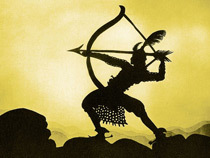 One of the first feature-length animated films ever made, The Adventures of Prince Achmed is a German film based on the folk tales of “One Thousand and One Nights.” Our prince, Achmed, goes through many challenges, all in the name of love. 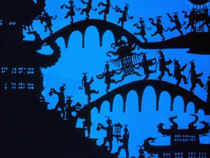 Its creator, Charlotte “Lotte” Reiniger (1899-1981) did the entire film in silhouette animation; like shadow puppets, the film uses cut-out figures, scenery--everything manipu lated for the camera frame by frame, a painstaking process which took Reiniger roughly three years to complete with the help of many artists. 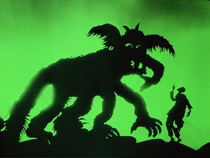 The film was released with color tinting which was lost when the original nitrate prints deteriorated; thanks to German and British archivists in the late 1990s, the film’s color tinting was restored. — 65 min. --Lunch Break, Noon to 1:00 p.m. 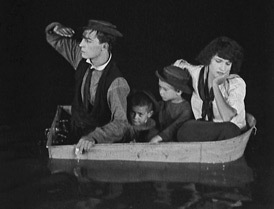 Afternoon - starts at 1:00 p.m.
Kansas’ own Buster Keaton (1895-1966) shines in this short film about a man determined to get his boat, which he has lovingly built himself, out to sea. With his family helping him, the boat finally makes it to the dock and is cast out—well, let’s just say it’s not smooth sailing. This is Keaton at what he does best—fighting the elements, inanimate objects, just about everything gets in his way including his loving family. His co-star is Sybil Seely (1902-1984) who made a handful of films before retiring from the screen in 1922. Several of her film credits are with Buster. 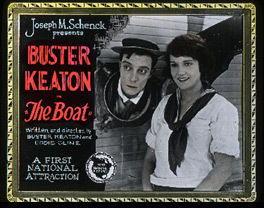 Keaton is credited with co-writing and directing this film with Eddie Cline (1891-1961). — 26 min. Making her KSFF debut is Pola Negri (1897-1987), a Polish-born star of silent films. Her films with director Ernst Lubitsch caught the eye of Hollywood and she and Lubitsch arrived in Hollywood in the early 1920s, leading the way for European directors and actors to make it big in America. Negri stars as a French farmgirl whose family has sacrificed much for the war effort. Her farm is being used as a German POW camp and her hostility toward the prisoners is strong until one prisoner shows his humanity and changes her mind. British actor Clive Brook (1887-1974) co-stars, with Clyde Cook (1891-1984) providing some laughs. The film was directed by Rowland Lee (1891-1975), whose career spanned well into the sound era. This film will be introduced by Sergio Delgado, an author from Overland Park, KS who has written a new biography of Pola Negri. — 72 min. A period piece from D.W. Griffith (1875-1948) is the earliest film in our festival this year. 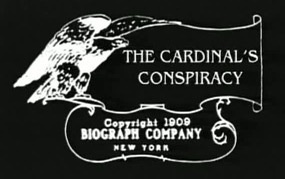 A young princess refuses the suitor her father picks for her so a plot is hatched by the Cardinal to disguise the young man and have him rescue the princess. Will the plan work? 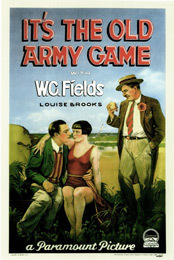 The film shows off the talents of two of Griffith’s company of actors, Florence Lawrence and Frank Powell. And as always there are any number of great supporting actors to round out the cast including James Kirkwood, Owen Moore and Kate Bruce. Be on the lookout for Mary Pickford and Mack Sennett. Since this film is listed by most sources as a comedy, the story no doubt came from the fertile mind of Sennett who provided, if not all, then most of the comedy that Griffith’s name was attached to in these early years. — 11 min. From an original story by his brother William, Cecil B. 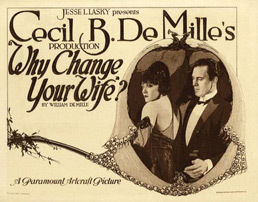 De Mille brings to the screen a story about marital discord and its repercussions. With a great cast led by Gloria Swanson (1899-1983), Thomas Meighan (1879-1936) and Bebe Daniels (1901-1971), and some great set pieces and fashion, this is one you won’t want to miss. Robert and Beth Gordon are married but share little. He runs into Sally at a cabaret and the Gordons are soon divorced. Just as he gets bored with Sally's superficiality, Beth strives to improve herself. Can she win her husband back? Before the biblical epics, De Mille (1881-1959) made some fantastic smaller-scale films, many with Swanson, one of his favorite collaborators. — 90 min. 5:15 p.m.: Supper Break — Program resuming at 7:30 p.m. The Cinema-Dinner venue is across the street from White Concert Hall (site of the KSFF) at Bradbury Thompson Alumni Center on the Washburn University campus. Tickets to this not-to-be-missed event are available for purchase by mail. The non-refundable price for the Cinema-Dinner is $40 per ticket, payable to Kansas Silent Film Festival. Mail your ticket request to: KSFF Cinema-Dinner P.O. Box 2032 Topeka, Kansas 66604-2032. Evening - starts at 7:30 p.m. Starting our evening off on a high note is Sennett favorite Billy Bevan (1887-1957) in a typical “two-reeler” that sets a crazy pace. Billy is a bit of a flirt who, in the heat of the moment, offers a young woman a string of pearls. She loves the pearls but not Billy. To top it off Billy doesn’t exactly own those pearls and ends up sneaking into her room that night to steal them back. But he gets caught and the chase is on! It wouldn’t be a Mack Sennett film without an elaborate chase scene and this little winner is no exception. Sennett Bathing Beauty Mildred June (1905-1940) joins the fun. 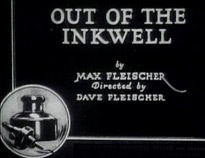 Directed by Roy del Ruth (1893-1961). — 20 min. We here at KSFF LOVE Lupino Lane. His short films never disappoint in terms of action and hilarity—his stunts alone are worth spending time with. Here he plays a newlywed who unfortunately loses his bride in Morocco to a caliph who kidnaps her for his harem. Lupino to the rescue! Lane (1892-1959) surrounds himself with family in this short; his brother Wallace plays the caliph and the caliph’s favorite wife is played by Violet Blythe, who happened to be Mrs. Lupino Lane. The bride is played by Helen Foster (1906-1982), a native of Independence, KS whose career as a leading lady peaked in the early 1930s. The film is directed by Charles Lamont (1895-1993) whose career in Hollywood spans five decades as actor and director—from silent films to television. — 20 min. “Fields was at his best constructing intricate sequences of gradually mounting frustration.” This pretty much sums up the heart of every W. C. Fields movie you’ll ever see. Take for instance our final film of the festival, one of Fields’ best silent films and one filled with great moments “of gradually mounting frustration.” Fields plays small town inventor (and imbiber) Sam Bisbee, whose daughter is romantically involved with the son of the town's wealthiest, haughtiest family. Bisbee has developed an invention he believes will make his fortune: a shatter-proof windshield. But can he convince anyone to invest? The film co-stars the lovely Alice Joyce (1890-1955) and an up and coming youngster from Olathe, KS Charles “Buddy” Rogers (1904-1999). Fields' granddaughter Dr. Harriett Fields will join us to talk about her famous grandfather and this film's showing.. — 67 min. Dr. Harriet Fields is W.C. Fields only granddaughter and Director and Vice-president of W.C. Fields Productions, Inc. (WCFP). Along with her brothers, WCFP own the rights to the image and likeness and intellectual property of their grandfather. 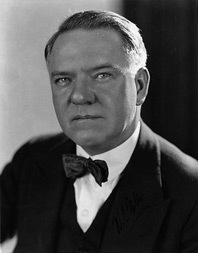 As the then Librarian of Congress, Dr. James Billington, said to her in his office about his fellow Philadelphian, W.C. Fields is the Icon of American Culture and Humor. Harriet is delighted to be back in Kansas again with many friends. It was in 2005 that Harriet and brother Allen were honored guests at the Keaton/Fields Celebration in Iola. Dr. Fields is passionate about ensuring younger generations and generations to come know the joy and comfort W.C. Fields art through humor brings to the human condition. Dr. Fields speaks widely throughout the U.S. and internationally about her grandfather and at film festivals honoring W.C. Fields. A nurse educator with an expertise in health care policy, Dr. Fields is based in Washington, DC, and is also passionate about empowering professional nurses to take leadership in humane health care reform. Within the last few years, Dr. Fields has developed an expertise in global health care and now does work in Rwanda to empower women in rural villages. While in Rwanda in March 2016, Dr. Fields screened a W.C. Fields film at the Kwetu Film Institute in Kigali. Another recent addition to her 'many lives', Harriet is now pursuing producing and playwriting and an Off Broadway play about an actual incident that happened to her grandfather while performing on Broadway in Earl Carroll's Vanities. The first performance of "The Real Transcript of W.C. Fields Murder Trial (of a Canary), 1928" took place December 21, 2015. Ben Model is one of the nation's leading silent film accompanists, performing on both piano and theatre organ. Over the past 35 years he has created and performed hundreds and hundreds of live scores for silent films. He is one of the few exponents of this craft who is working at it full-time, something that has not happened since around 1930. Ben is a resident film accompanist at the Museum of Modern Art (NY) and at the Library of Congress' Packard Campus Theatre. His recorded scores can be heard on numerous DVD/Blu-Ray releases from Kino/Lorber, Milestone Films and his own label Undercrank Productions, as well as on TCM and on his YouTube channel. Ben is a regular accompanist at classic film festivals around the U.S.A. and internationally, and performs at universities, museums, and historic theaters. Ben is the producer and co-founder of The Silent Clowns Film Series, now in its 20th season in NYC. Ben's composed ensemble scores for films by Chaplin and Keaton are performed around the U.S. every year by orchestras and by concert bands. Ben has co-curated a number of film series for MoMA, and also programmed two recent DVD box sets of Ernie Kovacs television shows. Ben is also a Visiting Professor of Film at Wesleyan University. Ben Model's appearance at the KSFF is underwritte by Paul Post. Sergio Delgado is a film historian, novelist, movie palace enthusiast and author of Pola Negri: Temptress of Silent Hollywood. 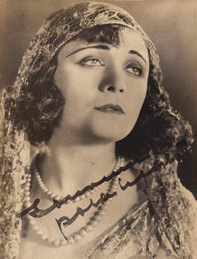 While researching motion picture exhibition in the 1920s for a novel concerning New York's palatial Roxy Theater, he became fascinated with the movie stars of the silent era and sought out their films and stories, particularly with the Polish born Pola Negri. Her life and career, enshrouded in myth, gossip and contradiction, demanded a biography to unravel this "exotic enigma" and give her her due as a great film star and personality. Mr. Delgado, a former resident of Topeka, now resides in Lenexa, Kansas, with his wife and a vast collection of silent film memorabilia. Denise Morrison is a film historian from Kansas City, Missouri with a special focus on silent film. She is Director of Collections & Curatorial Services with the Kansas City Museum in Kansas City, Missouri, and has been involved with the Kansas Silent Film Festival since the beginning. She was quite active with the Granada Theatre in Kansas City, Kansas, when they were showing a full schedule of silent movies. Denise will give an overview of the silent film era and also provide introductions to each film. Marvin Faulwell is a very accomplished theatre organist. He has played for all previous Silent Film Festivals and our "sister project," Silents in the Cathedral, held every Halloween at Grace Cathedral in Topeka. He has appeared in concert and accompanied silent film programs in Iowa, Nebraska, Kansas, and Minnesota and also accompanied many silent films shown at the Granada Theatre in Kansas City, Kansas. Jeff Rapsis is a New Hampshire-based composer and musician who regularly accompanies silent film programs. He appears regularly at venues including the Harvard Film Archive, the Library of Congress, and the Niles Essenay Silent Film Museum. Jeff is associate publisher and co-owner of HippoPress, New Hampshire's largest newspaper, and teaches communications at the University of New Hampshire. He has attended every Kansas Silent Film Festival since 2000! For more information on Jeff's silent film work, visit www.jeffrapsis.com. Bob Keckeisen has been principal percussionist for the Topeka Symphony Orchestra since 1989. He delights audiences at the Kansas Silent Film Festival and Silents at the Cathedral by adding remarkable percussive music and sound effects to many films. Bob grew up in Wichita and studied percussion under J.C. Combs at Wichita State University. He obtained both his undergraduate and graduate degrees in history from WSU and moved to Topeka in 1982. Bob recently retired as director of the Kansas Museum of History in Topeka, is assistant director of the Topeka Symphony Orchestra, and frequently volunteers for KTWU Channel 11. Kansas Silent Film Festival, Inc. is a 501(c)3 not-for-profit organization. This event is funded by generous donations, and welcomes your support. Your tax deductible gift will be gratefully acknowledged. Kansas Silent Film Festival, Inc.